← Does It Matter What Kind of Toothpaste You Choose? Halloween is fast approaching – time for goblins and ghouls, haunted houses, scary stories, trick-or-treating…and the obligatory news items in which dentists give tips for avoiding decay through the candy glut. Avoid sour candies, as their high acidity can damage enamel. Avoid sticky or gummy sweets, which cling to – and between – teeth, feeding the microbes that cause decay. Don’t graze on candy and sweets through the day, as this also perpetually feeds those microbes. Rinse your mouth with water afterward, or chew a piece of sugarless gum to stimulate saliva flow that will help clean the teeth. Notice the one I didn’t mention? Right: Toothbrushing – not because it doesn’t matter but because the conventional wisdom about it isn’t entirely accurate. Mitchell said the key to preventing tooth decay lies in limiting not only the amount of candy children eat, but also how long the sugar remains in the mouth. Unless “as soon as possible” means at least a half hour after eating the last treat, this actually isn’t the best advice in the world. This is because when we eat carbohydrates – and candy is little but carbs and, often, fat – conditions in the mouth turn acidic. Brushing at this time can damage the enamel. Over time, this leads to enamel erosion and a higher risk of decay. Oral acidity peaks at about 20 to 30 minutes after eating refined carbs and is usually back to normal within an hour. Consequently, it’s better to wait a while before brushing and flossing. 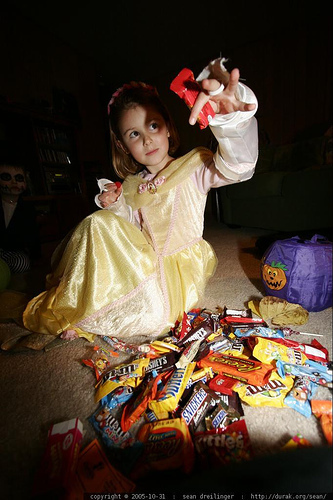 Perhaps a bigger question for health-conscious parents and guardians is whether and how to moderate kids’ candy consumption. Some, seeing Halloween as a special time to indulge, have no qualms about letting the kids enjoy the gluttony. Others prefer to set limits – x number of pieces per day, for instance, or only after dinner – while others let their child choose a portion to keep and then get rid of the rest, perhaps through a local dentist’s candy buy-back. Instead of buying my daughter’s candy back with money, toys, or other non-consumables, I offered to buy back my daughter’s candy with…more candy. Not just any candy, though, better candy. Yup. Instead of trying to de-candify Halloween I upped the ante. I allowed my daughter to swap any candy she didn’t absolutely LOVE for candy she adores. You can only be truly satisfied by eating foods you love. 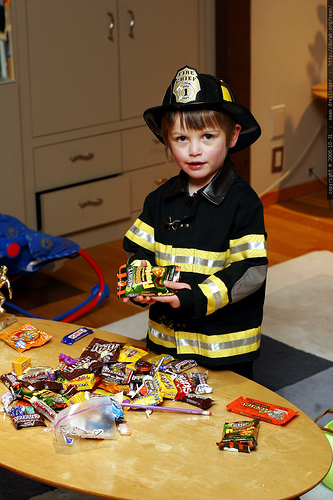 Unfortunately, Halloween teaches kids to eat what they get. It’s a kind of scarcity-response, even in the face of abundance. Eat what you LOVE, not what’s available. If there were ever a message that kids needed to learn, this is it. Instead, the real Halloween lesson goes something like this: eat as much candy as you can even if you don’t like it that much. And if you have a kid who doesn’t get candy that often, the message goes something like this: you better take advantage of this candy because you’re not getting a lot more of it in the near future. And who says that Halloween treats must be candy – or even food? There are plenty of kid-friendly alternatives – things like wax lips, temporary tattoos, sugarless gum, stickers, low-sugar trail mix or granola bars, blowing bubbles or other small novelties. So many times, I’ve heard people say kids consider their home the coolest precisely because they got something different – not just another candy bar.